Visited by Lawrence DuffThe Moi’s & Toi’s Museum is one of Chesapeake’s finest, newest and is possibly one of the most valuable collections of rares on Chesapeake. Today, proprietor Gwydion gave the news team a tour of the facility, and judging from the four singing balls within a 10×10 tile area, we knew that we were in to see some serious rares (but more on that later). To begin the tour and explain a bit, let’s start at the most primary location: the entrance. Moi’s & Toi’s is an old style Castle, and the main entrance is the room in the center on the main floor. A collection of dark colored furs greets visitors as a carpet under their feet. To the west of the room, ten vendors display complete sets of the new “armor sets”, less 3 pieces as of this writing. This room also houses storage in white chests, and a SillyHood Display vendor in the corner. A full set of coal armor is also worn by a vendor standing next to boxes displaying medals from the Chesapeake 2006 Olympics! At the very center of the second floor, Lord Gwydion has dedicated an area as a shrine to a family member who has passed away in the other realm. That shrine is met by a carpet of lightly colored furs, blood tiles, a spittoon, buckets and an unused tile locked on a table!! The North-East room is literally a purple room. It has a vast collection of sigil purple items (which are no longer creatable) and vendors wearing sigil items. The South-East room has an arrangement of potted plants, and items from the newer quests. The other two West, 2nd floor corner rooms have Gauntlet artifacts and a few other items. Heading down the NW stairs to the first floor, you’ll find a room with EM Event items including an infectious dagger, crude corroded manacles, ancient bones and a dark crystal shard. Along the west corridor are anvils of different metal types, and a few filled BODs for hard to obtain rewards. The South-West room is the clothing room, comprised of rare clothing types, magical clothing, RBG sashes from other shards and one very unique item that plays into Chesapeake’s PvP history: the original bonnet worn by Ed McManus (the PK from the guild KoC – Keepers of Chaos). 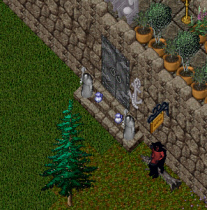 The North-East room has oddity rares which include coal ingots, oddly colored potions, blaze and ice white muffins, boxes of numbered price tickets and a head, a silver viking sword and a copy of a popular book on Chesapeake: “Murphy’s Laws of Ultima Online”. The other corner and Eastern hallway has Tokuno stealables and a brown colored L-shaped rock. The featured display at Moi’s & Toi’s is a little war mace known as the “Mace of Skyfire”. The Mace of Skyfire was part of a major Chesapeake quest during the days of the Seers. Dragar, a being who worn an icey armor set and lived in a mountainous lair (often refered to as Wintersoul Lair), threatened the shard and was sought to be defeated by a powerful warrior. That same year, a meteorite had landed in the jungles southwest of Trinsic, and a chemist from Verity Island known as Galen Solstarre investigated it as a possible source of metal for the crafting of such a weapon to defeat Dragar. Eventually the investigation proved to be a success, and a special tool was used to harvest ore from the site. Then the ore was melted down, and pounded into the shape of a mace by what is known as the “Hammer Pick of Skyfire” (the location of this item is unknown). The mace became the Mace of Skyfire, and it was used to defeat Dragar. Years later, the mace changed hands a few times before being purchased by Lord Gwydion. As of the publication of this review, the mace is on display on a table on the back wall of the first floor of the museum, alongside another rare weapon (G’Thunk’s Fist). As explained by Gwydion, in French the phrase “Moi’s & Toi’s” means ‘me and you’ and refers to Gwydion and Sionell (owners). As well, this reporter supposes, the name means the collection is here to be displayed to everyone as a dedication to shard history! Moi’s & Toi’s was also once located in the mountains of Malas, but the storage capacity was insufficient for all the rares, and now the Castle can be found on the north road from Minoc to Vesper in Trammel. Moi’s & Toi’s is the first museum to be reviewed on UO Stratics Chesapeake. The owners have also helped us test this new establishment review format, based on ease of information accessibility and room for a detailed and highly pictured review! If you know of a Museum on Chesapeake that is public and would do well with a review, send a message to [email protected] or PM Terence Duff on the Stratics Forums! Additionally, with the publishing of this review, Moi’s & Toi’s is now officially open to the public. You can find a rune at the UO Stratics Center in Zento or head to the castle by running from Vesper to the coordinates listed above!